When I say this, I typically get a blank stare. Looking for more free tips to grow your freelancing or consulting business? Click here to begin receiving my free newsletter or download chapter one of my top-rated book! Let me start by giving you the secret to finding the highest-paying jobs on Upwork: take advantage of job filters. When logged into your Upwork account, click “Find Work.” Click on a job “category” or enter a search term into the “Search for Jobs” box. On the left side of the page, you should see something like the following image. Learning how to use these filters is your key to identifying better Upwork jobs. Your instinct for finding clients might be similar to shopping on the Amazon marketplace: identify the nearest search box, type in a keyword, and press “Enter.” I’ll admit that I’ve probably taken this approach, too. In fact, I’m sure that I’ve identified and won several jobs this way. However, the problem with a “search only” approach is that it relies upon proper spelling and explanation by the client. For example, let’s say that you’re an SEO expert. You do a search for “SEO,” and you begin applying to jobs. While you may come across many decent opportunities, aren’t you ignoring clients who have failed to use the exact phrase “SEO”? In short, browsing jobs by category and using the search box in tandem is probably the best approach. What is the low-end of my service tier? How can I use fixed price jobs to generate long-term clients? What am I not willing to do? 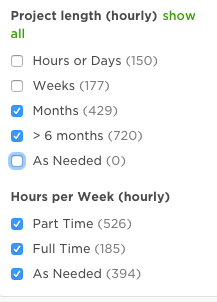 Once you’ve answered these questions, I suggest you then use an Upwork “Budget” filter to exclude those below (and perhaps above) your service tier. I personally set my lower limit at $250, but it was lower when I was just getting started in freelancing. I would probably also filter any job over $1,000, as I find it’s virtually impossible to properly scope a marketing project that is over $1,000. Here’s where many freelancers make a big mistake: they fail to use this filter. Arguably, this is one of the most important pieces of information that is at your disposal as a freelancer. Do not work for clients with “No Hires.” Let another freelancer take the risk on new clients. Your freelancer success score is way to valuable to risk it. If you’re looking for sustainability as a freelancer, then it’s best to start with longer term projects. Filter out short-term work by utilizing the “Project Length” and “Hours Per Week” filters. Personal preference: I would un-check “full time,” as I am not for-hire on a full time basis. This is for you to decide, however. 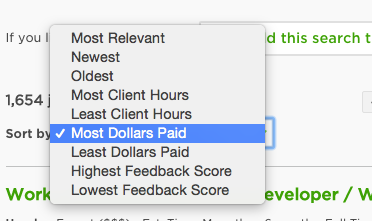 One final secret to finding the best paying Upwork jobs: sort your results by “most dollars paid.” This is how you identify the clients who are the most serious. Money talks. Have a secret not discussed in this post? Comment below and tell the world! Disclaimer: Obviously, this post is not a guaranteed strategy for freelancing success. It’s just my own personal perspective on how I go about identifying the best Upwork opportunities. great ideas matt. I believe in upwork and its making me more earning than any companies are paying for top developers. I work less earn more. Hey Terry – glad you found the tips to be helpful. Good luck on your freelancing career!